The Lake Oswego football team knew it had a chance to be good this year. After all, the Lakers had reached the Class 6A state semifinals in 2017, brought back a bundle of all-Three Rivers League players for 2018 and were determined to create another memorable season. Lake Oswego did just that, winning the Three Rivers League without a loss, going 13-1 for the season and winning the second state championship in school history on Saturday. In response for their great league season, the Lakers were rewarded big-time in the 2018 all-league voting, seeing 11 players named to the first team, including junior running back Casey Filkins as Offensive Player of the Year and senior lineman Mike Mercep as co-Defensive Lineman of the Year. For the year, Filkins rushed for 1,160 yards and 28 touchdowns on 171 carries, and also caught 48 passes for 869 yards and another nine TDs. "He's electric out there," Lake Oswego coach Steve Coury said of Filkins. "He just has a way of making guys miss. I mean, he's just really hard to bring down." Mercep, meanwhile, shared his POY award with Tigard's Isaia Porter after helping the Lakers limit opponents to fewer than 20 points per game, a year highlighted by his play in LO's semifinal against Jesuit when he sacked Crusader quarterback Will Spitznagel on three of the game's final five plays. "Mike has been unreal all year long," Coury said. "He is one of the best defensive players we've had here at Lake Oswego. He is a fierce competitor." Among the TRL's premier awards, Coury was named Three Rivers League Coach of the Year after leading his team to a 5-0 mark in conference play. Also picking up first-team honors for the Lakers on offense were: junior wide receiver Thomas Dukart (48 catches for 868 yards and 11 touchdowns on the season), senior tackle Tanner Hall, senior guard Ryan Bertelsen (Hall and Bertelsen helped the team average 403 yards and 38 points per game) and senior quarterback Jackson Laurent (he passed for 3,173 yards and 32 TDs with just two interceptions while completing 66 percent of his throws). The Lakers were tough on defense, too, limiting opponents to 128 rushing yards, 156 passing yards and fewer than 20 points per game. First-team picks for LO on defense were Mercep, junior defensive end Marshall McGuire, senior linebacker Gabe DeVille, senior linebacker Keenan DeRaeve, junior cornerback Joe Hutson, senior cornerback Matt Sebolsky and Dukart at safety. In total, Lakers were honored 23 times with all-league awards — 12 on offense and 11 on defense. Wide Receivers: Thomas Dukart, jr., Lake Oswego; Cade Knutson, sr., West Linn; Andre Martinez, sr., Lakeridge; Casey Tawa, jr., West Linn. Tight End: John Miller, jr., Tualatin. Tackles: Isaia Porter, sr., Tigard; Quinn McCarthy, sr., Tualatin; Tanner Hall, sr., Lake Oswego. Guards: Ryan Bertelsen, sr., Lake Oswego; Zach Zumwalt, jr., Oregon City; Mahmud Mustafa, sr., Tigard; Johnny Nomani, jr., Tigard. Centers: Ryan Seth, jr., West Linn; Dane Norlin, sr., Tualatin. Quarterbacks: Jackson Laurent, sr., Lake Oswego; Charlie Maynes, sr., Lakeridge. Running Backs: Casey Filkins, jr., Lak Oswego; Zakhayas Dennis-Lee, sr., Oregon City; Jalen John, jr., Lakeridge; Dawson Jolley, sr., West Linn; Malcolm Stockdale, sr., Tigard. Fullback: Kyle Kamp, sr., Tualatin. Placekicker: Kyle Dernedde, sr., Tualatin. Punter: Kyle Dernedde, sr., Tualatin. Kick Returner: Zakhayas Dennis-Lee, sr., Oregon City. Wide Receivers: Luke Ness, sr., Tigard; Calvin Green, jr., Oregon City; Will Scadden, sr., Lakeridge. Tight End: Marshal McGuire, jr., Lake Oswego. Tackles: Tiger Shanks, jr., Lake Oswego; Brian MacClanathan, sr., West Linn. Guard: Zach Ashcraft, sr., West Linn. Center: Mo Linver, sr., Lake Oswego. Quarterbacks: Drew Carter, so., Tigard; Ethan Long, sr., West Linn. Running Back: Dominique Loggins, sr., Tualatin. Fullback: Fletcher Ahl, sr., Tigard. Placekicker: Jackson Cleaver, jr., Tigard. Punter: Ethan Long, sr., West Linn. Kick Returner: Andre Martinez, sr., Lakeridge. Wide Receivers: Jazz Ross, sr., Tigard; Jett Searle, sr., Tualatin; Caden Dickson, sr., Tualatin; Jake Mastrandrea, sr., West Linn; Jahleel Heath, so., Oregon City; Jack O'Brien, sr., Lake Oswego; Joe Hutson, jr., Lake Oswego; Tanner Moore, sr., West Linn; Xander Houck, sr., Lakeridge; Luke Marion, jr., Tualatin. Tight Ends: George O'Brien, sr., Lake Oswego; Damiko Tidmore, jr., West Linn; Noah Jackman, sr., Tigard. Tackles: Keoni Hepa, jr., Lakeridge; Isaiah Cook, sr., Oregon City; Brock Duyck, sr., Oregon City; Luke Popma, jr., West Linn; T.J. Jakmauh, jr., Lakeridge; Bret Gydesen, jr., Tualatin; Hayden McDonald, sr., Tigard. Guards: Thomas Mitchell, sr., Canby; Eric Reilly, jr., Lakeridge; Broc Riskey, jr., Oregon City; Cody Van Meter, jr., Tualatin; Gavin Moore, sr., Tualatin. Centers: Kai Tinker, jr., Lakeridge; Kale Sorensen, sr., Oregon City; Mitchell Cross, sr., Tigard. Quarterback: Colby Iverson, sr., Oregon City. Running Back: Collin Bracken, sr., Lake Oswego. Placekicker: Christian Ferreyra, so., Oregon City; Max Chandler, sr., Lakeridge. Punters: Fletcher Ahl, sr., Tigard; Max Chandler, sr., Lakeridge. Kick Returners: Max Lenzy, jr., Tigard; Matthew Sebolsky, sr., Lake Oswego; Jake Anderson, sr., Tualatin; Ethan Loun, jr., West Linn. Linemen: Isaia Porter, sr., Tigard; Ryan Seth, jr., West Linn; Mike Mercep, sr., Lake Oswego; Marshal McGuire, jr., Lake Oswego; Dane Norlin, sr., Tualatin; Javier John, sr., Lakeridge; Noah Jackman, sr., Tigard. Inside Linebackers: John Miller, jr., Tualatin; Gabe Deville, sr., Lake Oswego; Brian MacClanathan, sr., West Linn; Mitchell Cross, sr., Tigard. Outside Linebackers: Keenan DeRaeve, sr., Lake Oswego; Elijah Ntsasa, sr., West Linn; Zakhayas Dennis-Lee, sr., Oregon City; Jazz Ross, sr., Tigard; Kyle Kamp, sr., Tualatin. Cornerbacks: Max Lenzy, jr., Tigard; Joe Hutson, jr., Lake Oswego; Casey Tawa, jr., West Linn; Matthew Sebolsky, sr., Lake Oswego. Safeties: Thomas Dukart, jr., Lake Oswego; Max Jacobs, sr., West Linn; Jett Searle, sr., Tualatin. Linemen: Mahmud Mustafa, sr., Tigard; Jake Reser, jr., Tualatin; Keoni Hepa, jr., Lakeridge. 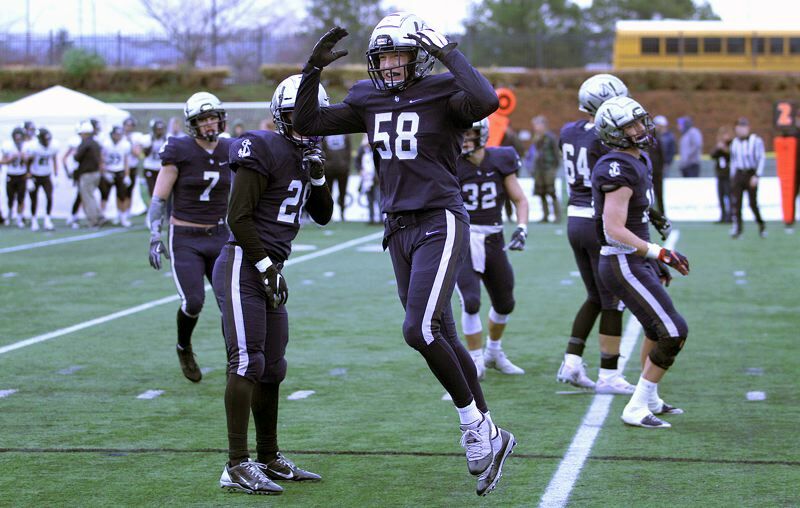 Inside Linebackers: Bryson Breeze, sr., Lake Oswego; Ty Glumbik, jr., Lakeridge. Outside Linebacker: Fletcher Ahl, sr., Tigard. Cornerbacks: Dawson Jolley, sr., West Linn; Caden Dickson, sr., Tualatin. Safeties: Luke Marion, jr., Tualatin; Finn Reeves, sr., Lakeridge; Hunter Daskalos, sr., Lakeridge. Linemen: Stephen Rue, sr., Canby; Mario Pronnarongvat, sr., Lake Oswego; Johnny Nomani, jr., Tigard; Damiko Tidmore, jr., West Linn; Brock Duyck, sr., Oregon City; Kale Sorensen, sr., Oregon City; Anthony Treadwell, sr., Oregon City; Miles Lewis, sr., Lake Oswego; Adrian Sandoval, jr., West Linn; Cody Van Meter, jr., Tualatin; Gavin Moore, sr., Tualatin; Lucas Cloyd, so., Oregon City. Inside Linebackers: Carter Dennis, sr., Tigard; Cole Peters, sr., West Linn; Garrett Boespflug, sr., Tualatin; Kegan Kmetic, sr., Oregon City; Chris Todd, sr., Lake Oswego; Jackson McGinley, sr., Lakeridge; Hunter Manassero, sr., Oregon City; Josh Boespflug, jr., Tualatin. Outside Linebackers: Casey Smith, sr., Lakeridge; Cole Lundmark, jr., Oregon City; Chase Fletcher, jr., West Linn. Cornerbacks: Andre Martinez, sr., Lakeridge; Josh Burns, jr., Tigard; Jared Bartunek, sr., Lakeridge; Tanner Moore, jr., West Linn; Caiden Biege-Wetherbee, jr., Lakeridge; Cade McCarty, jr., Tualatin. Safeties: Spencer Kuffel, so., Tigard; Brodie Corrigan, sr., West Linn; Austin Canchola, jr., Oregon City; Dylan Burch, sr., Tigard.